A single entry blog about Mike, RJay, Heath and me on a 2-day golf trip to Boise, ID. We all get approached for donations to various charities; some more creditable than others. One of the finest and most long standing charity organizations is the United Way. A buddy of mine, Heath Mitchell, has donated annually to United Way due to an effort that Zions Bank (Heath�s employer) has engaged in order to raise funds for the charity. In 2009, rather than soliciting straight donations, it was decided that a variety of items would be auctioned with all the proceeds going to the United Way. As Heath looked over the items up for auction, one item became of particular interest; lunch and a foursome at Spurwing Country Club outside of Boise. Heath monitored the status of the auction and placed a winning bid; a golf trip would shortly ensue. Heath contacted the Gurus and R.Jay and we started planning a weekend visit to Idaho�s capital. I actually knew very little about Spurwing Country Club but I�m always excited about playing a new course so I was glad Heath came through with that auction. 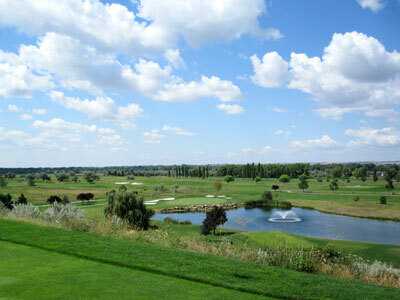 I�d been anxious to get back over to the Treasure Valley for the past year in anticipation of playing Hunter�s Point; a new Gene Bates design. With those two courses locked down, it was time to decide on two more tracks. Neither Heath or R.Jay had played Hillcrest Country Club or Falcon Crest, two fine tracks in the area, so those courses rounded out the itinerary for our trip. We loaded up in the car prior to sunrise on Friday morning and headed over on I-86/I-84 to our state�s capital. The first round of the trip was at Hillcrest Country Club; host of the Albertson�s Open on the Nationwide Tour. Prior to arriving at the course we stopped by a convenience store where we purchased some less-than-desirable breakfast sandwiches and some sports drinks. We eventually found our way over to Hillcrest and found that our car was virtually the only one in the parking lot. With a light drizzle falling from the sky, we grabbed our clubs and checked in at the pro shop. The head professional and staff at the course were great and the members welcomed us at every opportunity. After a brief stop at the driving range, we headed to the first tee and began our adventure. Hillcrest is a classic, historic course with mature trees and plenty of doglegs. While not overly long, the course bites back with thick rough and well placed bunkers. 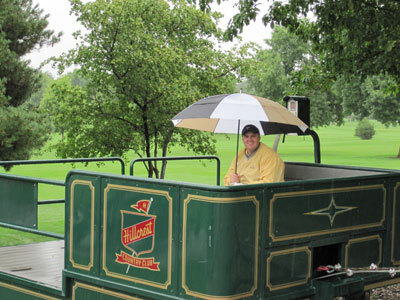 One of the unique features at Hillcrest is the passenger train that is setup along the steep fairway on the 9th hole. R.Jay couldn�t resist hopping on for a ride, as the photo below shows. Despite the on-again-off-again rain, we had a great time at the course. We had a couple of hours to burn before our afternoon round at Falcon Crest so it was time to find something to eat. It is pretty much tradition that sometime during a golf trip the Gurus are going to find their way to a Chinese buffet, and this trip was no exception. With the rain no pouring down, we dashed into the nearest buffet that was located within a strip mall. We weren�t there long before we realized we had made a mistake. The buffet was one of the saddest eating experiences of our collective lives. The soup had a crusty film floating on top, the sweet and sour chicken had more grease than meat, and the salad bar consisted of some wilted iceberg lettuce, a few shriveled cherry tomatoes, and a bucket of ranch dressing. In fact, there was only one item on the buffet line worth putting in our digestive tracks. We decided to fill up on diet soda and get out of there ASAP. With the rain dumping down, we loaded up and headed over to Falcon Crest. As we worked out to Kuna the rain backed off and we were able to get our clubs out and play some golf. We were sent out on the Freedom course first, a nine hole track that just opened as a tribute to the course owner�s son who passed away while serving his country. The Freedom course is LONG, over 3900 yards from the back tees, with the 5th hole measuring a staggering 714 yards. After getting our tails handed to us, we moved onto the championship course. Falcon Crest, the dream of Hans Borbonus, is one of my favorite tracks in the Treasure Valley. 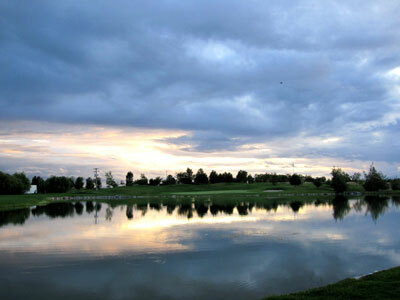 The front nine consists of several elevation changes, water hazards, and interesting challenges. The crowning moment of the course occurs on the 18th hole; the toughest finishing hole in Idaho. A large pond front the green and prevents you from hitting your tee shot any closer than about 160 yards to the green. If you hang your tee shot out to the right at all, you�ll be left with a downhill lie in the rough from over 200 yards out and a sure fire setup for plunking one into the drink. When we got to the challenging 18th hole the daylight was fading fast. With our 2-man best ball match on the line, we ended up having to play the hole twice to settle the score. That night we headed over to Fuddrucker�s to pound some hamburgers, fries, and shakes. I ordered the one pound burger and of course had them load it up with bleu cheese; my favorite hamburger topping. It wasn�t quite as good as the 1 lb. bleu cheese bacon burger that I order at Big Judd�s each time I�m given the opportunity, but it still hit the spot just fine. After stuffing ourselves, we head over to the Red Lion to get some sleep before picking up 36 holes again the next day. In the morning we found ourselves at Hunter�s Point golf course. The entire course is planted in bentgrass which is extremely rare for Idaho. Generally, all the greens are bentgrass but the fairways are bluegrass. Bentgrass fairways create very tight lies and much less forgiveness but offer a beautiful playing surface. Hunter�s Point originally was slated as a private course but due to financial difficulty was unable to keep its aspirations and has become a public track. 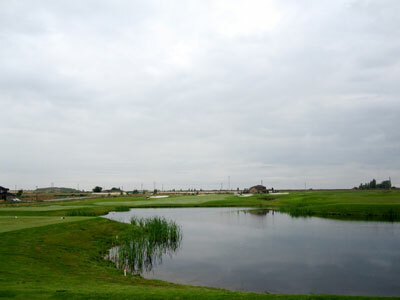 The course is highlighted by six-hole stretch found in a quarry that begins the back nine and features a pair of water hazards. Once we pulled out of the quarry it was time to take on the 669 yard par five 16th hole. After hammering our drives down the fairway, we load up in our carts and roll out to see what we are left with. We drive past Mike�s ball and therefore have to put the cart in reverse to get back to the ball; big mistake. After dropping it in reverse, the cart�s transmission gave up the ghost. We took our other cart and used it to push the dead cart back to the pro shop. After our round, the staff promptly refunded the majority of our cart fee for our troubles. With lunch on our minds, it was time to head over to Spurwing Country Club. Heath�s auction item included lunch in the dining room at the club so we found our way back to the well-appointed dining area. We ordered our food and enjoyed watching SportsCenter on the large flat screen TV that was mounted to the wall nearby. R.Jay, aka the fashion police, noticed that one of the guys in the dining room was wearing one of the best looking hats he had ever seen. Upon further examination, he noticed that is was sporting a Black Rock logo which is a private club up in the Coeur d�Alene area. A couple of summers before, Bill took R.Jay up to play the course and exposed R.Jay to some of the finest golf in the entire country. We had the unique opportunity of golfing with Jim Engh, the course�s designer, that day as he was up in the area on vacation with his family. It was a real thrill to have that experience and to �pick the brain� of one of the most popular architects on the planet right now. Anyway, R.Jay nearly made a cash offer to buy the gentlemen�s hat right off his head, but he resisted and we made our way out to the course. Right off the bat, you�ll notice that Spurwing has some good length to it as it stretches out to over 7100 yards. The course is kept in exceptional condition and there are some really solid holes found throughout the track. The signature hole is the nearly 200 yard par three 6th hole. The elevated tee requires a shot that must carry a large pond to find the putting surface. When the wind is howling this can be a treacherous shot to contend with given the 75 foot drop or so from the tee box. The back nine is highlighted by the par four 14th hole which feature water up the right side that crosses across the fairway and fronts the green. It is a risk/reward tee shot as you test whether you�d like to contend with the majority of the water off the tee or on the approach shot. Overall, Spurwing was quite a bit nicer than I was expecting. I knew very little about the course before playing and thus assumed it couldn�t be �that good� if I hadn�t heard much about it; nice ego eh? After our round we quickly loaded up and started heading back for Pocatello. Along the way, Mike and R.Jay�s bladders had reached their capacity from the diet sodas consumed throughout the day. With no rest area or McDonald�s in the vicinity, we pulled off to the side of the road so that they could fertilize the nearby weeds. Heath captured the moment with the camera on his cell phone. The pics haven�t showed up on Facebook yet, but you never know what might surface from a golf trip.